The United States and Israel have exchanged criticism over the issue of Israeli settlements in the West Bank. On December 23, the Obama administration allowed the United Nations to pass a resolution that declared Israel’s growing settlements in the occupied territories illegal. Until that vote, the Obama administration had blocked resolutions criticizing Israel by using its veto power in the UN Security Council. Days later, on December 28, Obama’s secretary of state, John Kerry, gave a speech in support of what is known as a two-state solution for the area. Kerry started the speech by saying the U.S. remains committed to Israel’s security. He criticized Palestinian leaders for not doing more to stop terrorist attacks on Israel. By settlements, Kerry meant Israeli efforts to build new housing in the West Bank. Israeli leaders say religious history and security concerns justify the housing. Palestinian leaders and many world leaders consider Israel’s West Bank developments as a barrier to a peace deal. Such a deal would give the Palestinians their own state in exchange for lasting peace with Israel. He said the Israeli settler movement ignores the “legitimate” hopes of the Palestinian people for their own state. Republican Donald Trump replaces Democrat Barack Obama as U.S. president on January 20. In a post on the social media site Twitter, he suggested the Obama administration’s Israeli policy will not continue. Trump recently named lawyer David Friedman as his U.S. ambassador to Israel. Friedman has been a strong supporter of Israel’s settlement movement. Obama and Netanyahu have not had a friendly relationship for much of Obama’s eight-year presidency. Netanyahu took the unusual step of delivering a speech critical of the U.S. president to the U.S. Congress in 2015. The speech criticized the nuclear deal the Obama administration and leaders of other nations were about to sign with Iran. 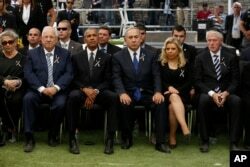 Barack Obama, Israeli Prime Minister Benjamin Netanyahu sit during the funeral of former Israeli President Shimon Peres. Netanyahu gave his own speech one day after Kerry’s. He was critical of Kerry and the Obama administration. “What he (Kerry) did was to spend most of his speech blaming Israel for the lack of peace by passionately condemning a policy of enabling Jews to live in their historic homeland and in their eternal capital, Jerusalem,” Netanyahu said. He accused Kerry of not doing enough in his speech to discuss the “campaign of terrorism” by Palestinians against Israel over a long period of time. Kerry, in his speech, said the Obama administration has been Israel’s “greatest friend and supporter.” He said he and the president have continually spoken out against terrorism against Israel. But he said the U.S. had no choice but to criticize the growing Israeli settlements that, he said, threaten a two-state peace agreement. He said the number of Israeli settlers on the West Bank increased by 100,000 since Obama became president. “Now, one thing we do know: if Israel goes down the one-state path, it will never have true peace with the rest of the Arab world, and I can say that with certainty,” Kerry said. VOA News reported on this story. Bruce Alpert adapted the story for Learning English and did additional reporting. Mario Ritter was the editor.